A new yacht for Sunreef, this sailing superyacht catamaran was built for a repeat catamaran owner with a knack for adventure. Built on the same mold as the Sunreef 82, which includes Houbara, this hull is more streamlined for increased performance and a sportier appearance. Viewed from profile, the freeboard is substantially lower than it is on the 82. 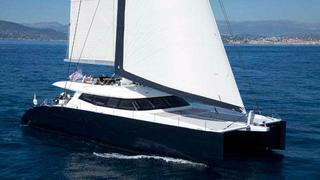 Boat International and ShowBoats was invited aboard the new catamaran for a cruise off Cannes. Although there was little wind on the day preceding the opening of the Cannes boat show when we got aboard, and the yacht was temporarily devoid of its genneker, under good wind conditions the yacht is capable of a top speed of 20 knots under sail, according to Sunreef Naval Architect Thomas Serré, who came along for the ride. Fully rigged, the sail area (which includes main sail, genoa, both made of Vectran and gennaker, made of Cuben fibre) is 340 square meters. A well-equipped helm station on the main deck provides the skipper with data collected from sensors installed on mast, winches and rigging, as well as displays alarms on crisp and easy-to-read displays. Ocean Data System provided the monitoring system. A central Upside Up monitor includes a man over board feature for safety. Automated systems allow this yacht to be operated by a crew of three or four. The hull, weighing about 17 tons, is built in a sandwich of fibreglass, foam, carbon fibre and vinylester, but the top deck, masts and boom, which Sunreef built in-house, are in carbon fibre. Weight was a big an important consideration on this project and, after careful monitoring during the entire construction process, the yacht came in at just under 45 tons lightship. Levante’s interior décor (featuring a sophisticated blend of white lacquer surfaces and dark flooring) is best described as minimalist, but the spaces are generous. A 17sqm master cabin on deck offers panoramic view and provides access to a private bathroom located below in the starboard hull, where a kids cabin with two bunks and a single bed is also located. A cozy salon with dining area, two VIPs cabins (one located aft in each of the hulls) and a large and well-equipped galley, plus three berths for crew located in the portside hull, complete the accommodation. As is to be expected on a catamaran, the deck spaces are inviting. A big aft deck accommodates a large table for outdoor meals, well protected from the sun and generous seating. The easily accessed flybridge deck has another table, banquette and comfortable sun pads. With a breeze and the Bose sound system delivering great sound, it is likely to be the favourite spot to enjoy navigation, although the forward net may prove hard to resist as a place to stretch out on a quiet and sunny day. Located nearby, a large and deep forward compartment hides a large array of water toys, from kayak to kite surfer and diving equipment. To motor back to port, two 240-hp engines deliver a speed of 10 knots at 2,200 rpm, allowing for a top speed of about 12 knots. The tender is easily launched and retrieved from two cranes located aft, a system Sunreef has adopted on many of its catamarans. The owner has extensive cruising plans, starting with the British Virgin Islands during the winter, and the yacht will also be available for charter.